My first day on the job as a newspaper photographer the editors chose a photo that I made to be published on the front page. It made me very proud to see my hard work in college come to fruition and I wanted a keepsake. The next night I went into the press room and found a older man walking around looking at a piece of cardboard paper with pen scribblings on it. He was making the newsprint roll order he would need for that nights press run. His name is Sherman Dilbeck. He was very quiet and seemed approachable. I introduced myself and asked if there was any way to get a copy of the metal plate, used in the press to print the newspaper, that my front page photo was on. He said yes and went through a stack of sheet metal plates and found the one from the front page. He told me he had worked the night before and I asked him to sign the plate for me so I would remember him. He obliged and we have been friends since. 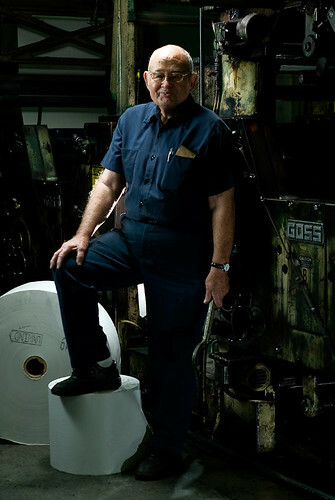 Tonight is his last night working on the press. As for most of the 35 years of working here he came in early and with cardboard paper in pocket he pulled all the newsprint for the press run down off the back room racks with the fork lift, took his milk (chocolate) break and waited for the other guys to show up.